Getting ready for a crazy weekend of makeup and mayhem. I am booked for several private makeup sessions and classes--but still have some free time on Day of the Dead if anyone wants their makeup done. For this Saturday's Pretty Pretty (Look at You! ), I'll be putting on my Pearls face and making up the lovely Bonni Suval, of Shocktoberfest, "Kiss of Blood" fame. I'll be demonstrating some lovely zombie techniques on her. Please come by if you can... Come early if you really want to stick around and watch. The store is going to be very busy and it's going to be standing room only! I did zombie makeup for an army of kids, who performed "Thriller" at Stern Grove's Halloween Festival, Scare Grove. I posted a video below. I'm hoping someone took photos or video from a closer distance, because those kids looked amazing. I did some face painting for grownups at Les Folies Champagne, at the Bubble Lounge. Shocktoberfest, "Kiss of Blood" is going strong. Also, my father came and saw "Pearls Over Shanhai." Something I never thought would happen, but that went over quite well! I resisted the urge to write "Hi Dad" for "Sweet Temple Bells," but don't think the thought didn't cross my mind. Last night was the opening reception for Tennessee Loveless's show at the Glama-Rama Salon. It was AMAZING! 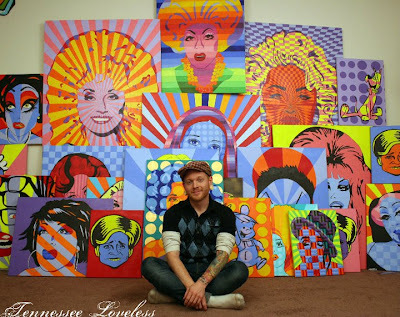 Stop by the Glama Rama and see the kaleidoscopic vision of Tennessee Loveless featuring famous cartoon characters, SF celebrities and drag icons! I'm not sure how long it's going to be up for, but definitely go. I'm very excited to be telling a personal story tonight with the podcast that got me into podcasts! 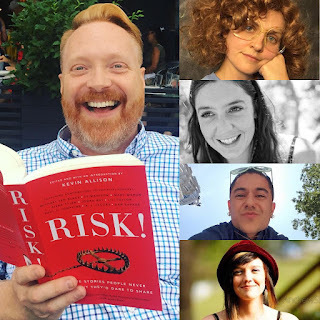 Find more info on Risk!, including a new book at risk-show.com! Today I’ve met a personal goal—to be single for at least a year. I'd like to share about this. Since I was 15, I’ve been in one romantic relationship or another, with the longest time between relationships being around 3 months. I’ve been in 2 relationships that were over 5 years long and 5 relationships that were over 2 years long. I've had some really wonderful partners, but it was often the luck of the draw. I was casting a pretty wide net.